ST. ERENTRUDIS, OR ERENTRUDE, VIRGIN ABBESS OF NUNBERG, BAVARIA. ...At the 30th of June, Colgan intended to insert the Acts of St. Erentrudis, virgin, as would appear from his list of Irish Saints, published by Charles MacDonnell, Esq. Henry Fitzsimon has classed her among the Saints of Ireland, but without assigning the date for her festival. In their Legendary for the month of June, the Canons Regular of Bodensee Monastery in Westphalia appear to have had special Lessons in an office for St. Erendrude. The Bollandists have published a previous commentary, and Acts of St. Erentrude, at this date. The Third Volume of the "Acta Sanctorum Ordinis S. Benedicti," contains the Life of St. Erendrude, Abbess. This holy virgin, from an early age consecrated to God in the religious state, is said by some writers to have been a sister to St. Rupert, bishop of Saltzburg, whose festival was celebrated on the 27th March. In Colgan's work, at the same day, there are a few brief notices; but, in the Bollandist collection, there is no special feast assigned for her, at that particular date. Already there are some particulars concerning her recorded in the Life of her reputed brother St. Rupert. In it, we find her called a relation to him; while some writers state, that she was his niece, according to Rev. Dr. Lanigan. He does not consider, however, that she had anything to do with Ireland, although such an opinion has long prevailed in Germany. She seems to have been born, towards the middle of the sixth century. In St. Rupert's Life, it is stated, that from Ireland she travelled to Rome with both her brothers, St. Trudbert and St. Rupert. They returned in company together from Italy to Germany; when, at Prysgangia or Brisgangia near the Hyrcinian forest, St. Trudbert parted from them, and soon afterwards he obtained the martyr's crown. Thence, Rupert and Erentrude journeyed along the Rhine, until they reached Bormatia, now known as Worms. Over this city, Rupert presided as Bishop, but he was driven from it with violence about the year 580. Afterwards, he visited Rome, and then he returned once more to Bavaria, Austria and Pannonia. At last, he became bishop of Saltzburgh— that city so romantically situated on the Salza River, which flows into the Inn, and under the range of the towering Carinthian or Rhoetian chain of high-peaked Alpine mountains. The citadel here—no longer kept in repair —stands on a bold and commanding rock.One of its gateways is cut through a solid rock, being 300 feet in length, 30 feet in height, and 24 in breadth. The cathedral here—Italian in style of architecture is an imposing structure, and of great historical interest.There can hardly be a doubt, but St. Erentrude shared in the vicissitudes, hardships and persecutions of her distinguished brother; although her personality is lost sight of in his Acts, until we learn, that he built for her a monastery, at a place called Nunberg. This idea was of her own suggestion; for, she most earnestly desired to assist her brother in his missionary labours, among a rude and halfcivilized people. This nunnery of St. Erendrude was situated without the fortifications of Salzburg, and on a neighbouring hill. Anciently, this place was known as the Cell, and called by such a name. From accounts that have come to us, it would seem, she had a place among the Wangiones, in the city of Worms. 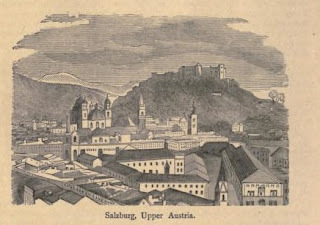 St. Rupert had built a suitable house of reception for herself and her nuns, near Salzburgh; while, she felt greatly delighted to join him there. That house had been consecrated to the Blessed Virgin. When she arrived at Salzburgh, St. Rupert accosted her thus: " My revered sister, know why I have brought you hither?" She replied: "Yes, Father, I know it well, as our Lord Jesus Christ revealed it to me in spirit, saying, go in peace where you are called, and lo, I am with you; I shall bring to you great numbers of pious women, who, through your example conducted in the pathways of true religion, shall finally come to me." When St. Rupert heard these words, he gave thanks to the Almighty. It is said, that Theodobert, Duke of Bavaria, aided in building this religious house, and that he liberally endowed it, while he took care, that the memory of his father Theodon, converted by St. Rupert, should be remembered in the prayers of those holy virgins there serving Christ in the religious state. After some time, numberless pious virgins and holy matrons flocked to her religious establishment; and over these, she presided with such consummate prudence, that soon they were trained to all the duties of perfect nuns. An account of the remarkable vision, touching the death of her illustrious relation St. Rupert, will be found in Acts of the latter, published by the Bollandists. She presided as first Abbess at Nunberg over a community of pious virgins, some time after the beginning of the seventh century. About the year 627 or 628, when St. Rupert had a divine monition, that his days on earth were nearly numbered, he held an interview with his beloved sister, and revealed his approaching departure to her, while he requested her to pray for his soul, that the Almighty would vouchsafe to receive it into Heaven. This announcement drew tears to her eyes, and she immediately replied in a sorrowing mood: "If this should happen, my Lord, as you state, is it not more expedient that I should depart before you ?" The holy Bishop answered her: "My dearest sister, do not desire importunately and prematurely to hasten your passage from this world, as it should be a great sin so to do; since our death depends not on our wish, but on the disposition of Divine Providence." Whereupon, St. Erentrude in tears fell upon her knees at the feet of St. Rupert, saying: "My paternal Lord, remember, I beseech thee, that from my country thou has brought me hither, and now you intend to leave me miserable and an orphan. One request only have I now to make, that if I deserve not to die before or with thee, that at least, soon after thy departure to Heaven, I may have a much-desired release from earth, through thy intercession." The holy Bishop Rupert assented to this her petition, and then both began a colloquy on the happiness of life eternal. So tender was their conversation and the flow of natural sympathy, during this affecting juncture, that both separated, while tears flowed plenteously from their eyes. We are informed, that after St. Rupert's death, St. Erentrude persisted tearfully in prayer by day and night for the soul of her relation, while her vigils were prolonged, with the hope of having her earnest wishes crowned. One night, he appeared to her in a vision, and saying to her: "Come, my dearest sister, into the kingdom of Christ, for which thou has so long laboured." Awaking as it were from a dream, she then returned thanks to the Almighty. Soon afterwards, serious illness fell upon her. Then, calling her sisters to her bedside, she lovingly exhorted them. Having received the Holy Eucharist, she gave them severally the kiss of peace, and then calmly rendered her soul into the keeping of her Divine Redeemer. The date for her death has not been recorded, but it occurred, probably, about A.D. 630. Her sacred remains were brought into Salzburgh, and there embalmed. They were afterwards deposited with great reverence, in the crypt of the Monastery of the Blessed Virgin, the day before the July Kalends, at which date her chief feast is commemorated. Several very remarkable miracles were wrought at her tomb, and through the intercession of this holy virgin, whose memory was so greatly revered by the people. In consequence of those miracles, it is stated, that St. Virgil, Bishop of Salzburg, had her canonised, and afterwards, her remains were translated, in order to be more publicly honoured. In course of ages, the monastery of St. Erentrude suffered from hostile incursions and from incendiarism, so that it had been reduced to a heap of ruins. Afterwards, the Emperor Henry II., surnamed the Pious, resolved on the restoration of this religious establishment, dedicated to the Blessed Virgin Mary and to St. Erendrude. This distinguished Imperator is stated to have been subject to epilepsy, which his physicians could not cure; but, when he came to the tomb of St. Erendrude, and had prayed there, he obtained some of her relics, which he enclosed in a golden locket, and wore suspended from his neck. Afterwards, he was relieved from that infirmity, and as a token of gratitude, he presented two golden calcaria to ornament her tomb. About the year 1024, the Emperor Henry II. of Germany, having effected the restoration of St. Erentrude's monastery, or rather having rebuilt it; the chief altar in the crypt, and two others, are said to have been consecrated by Balduin, Archbishop of Salzburgh, about the year 1041. This monastery of St. Erentrude was liberally endowed by the aforesaid Emperor. It is stated, furthermore, that the church so renovated had been consecrated to the Blessed Virgin and to St. Erentrude, by Archbishop Hertwic, the Emperor himself assisting. Afterwards, the body of St. Erentrude was removed with great reverence, from the ancient tomb in which it had so long lain, to a crypt beneath the middle altar, where it reposed in the beginning of the fourteenth century. It seems possible, also, that a subsequent Translation took place. The year 1305 is that generally assigned for the Translation of St. Erentrude's relics, at Nunberg, and the day was on the 3rd of September. This was kept as a holyday by the citizens, and on it they abstained from all servile works. An office commemorating this solemnity was also recited by the nuns. This translation of her relics, to the crypt of the church in which they are now preserved, was most probably on the 3rd of September, which is a feast kept in her honour. ST. COCHA OR COCCA, ABBESS OF ROS-BENNCHUIR. WE have to regret, that indications are not more clear, in reference to the pious female saint, whose celebration in our Calendars has been assigned to this day. However, we can only present, as we find them, the few particulars, that seem to be on record. This holy virgin has her name usually written Coca or Cocca; but, incorrectly, it has been converted into Concha and Cota. In an English Life of St. Kieran of Saighir we find this saint called "Coinche." In the Martyrology of Tallagh, at the iii. of the Kalends of July —June 29th— and included with that of other saints, there is a festival for Cocca, of Ruis Beandchoir. The greater portion of the Life of St. Cocchea is to be found interspersed and interwoven, so to speak, with the Life of the great St. Kieran, whose nurse and guardian it was her privilege to be. Owing to these circumstances, it appears to be altogether probable, that she was born, or at least, that she lived for some time, in the Island of Cape Clear, in the present county of Cork. She is stated to have been the nurse of St. Kieran of Saigir; and if so, her period should date to the beginning of the fifth century. She may have been converted from the errors of paganism, by receiving baptism at the hands of her Apostolic foster-son. St. Cocca is related, to have embraced a religious life, and to have presided over the monastery of Ros-bennchuir. That it was situated on the sea-coast appears from the Life of St. Kieran of Saigir, who was one of the principal coadjutors of St. Patrick, in the southern parts of Ireland. The principal work of St. Cocchea consisted in presiding over the education of noble virgins, who were entrusted to her care, some for a time, and others for life. St. Cocchea rendered the greatest assistance to St. Kieran, in propagating the Christian faith. The religious establishment of Ross-bennchuir was possibly situated on the western coast of Clare County, as has been stated, but on what ancient authority is not cited. Perhaps this place was identical with the townland of Ross, on the sea-shore, in the parish of Kilballyowen, in the barony of Moyarta, in the south-western part of the county of Clare. There St. Cocha's nunnery— according to one writer —was situated, about twelve miles W.S.W. from Kilkee, in that county, and within a few hundred yards of the Natural Bridges of Ross. The ruins, we are told, present no interesting architectural features. In the Life of St. Kieran, we are told, that he sent oxen each year from Saigir to this place; and, although the distance was considerable, it is said, they always went in a direct course to Ros-benchuir, without being even conducted by a driver. These oxen were sent to plough the lands of St. Cocca, and after the ploughing season was over each year, they returned again to Saigir. There is a small ruined church in the townland of Ross, and which is called Teampull-an-naonmhar-naomh, i.e., the church of the nine saints. Of this edifice, the west gable and side walls remain to the full height, with 4 feet of the under part of the east gable. It measures 34 feet 4 inches in length, by 15 and a half in breadth. At the distance of 24 feet, south from the ruin, is what the peasantry call the grave of the nine saints. This grave measured 33 feet in length, from north to south, 7 feet 9 inches in breadth, and it was 2 feet in height. The sides were built up of loose stones, after the ordinary manner of graves. We are also told, that on each festival of our Lord's Nativity, after the people had received Holy Communion from St. Kieran's own hands, in the monastery of Saigir, he was accustomed to proceed to the monastery of St. Cocca, at Ros-bennchuir, that he might again offer up the Holy Sacrifice there, and on the same morning. After St. Cocca and others had received communion from him, he returned again to Saigir, before the dawn of daylight. Relating these circumstances, the ancient writer of St. Kieran's Life remarks, that he and others knew not by what means this saint went and returned, as he concealed such matters from them —meaning his monks. We are informed, that there was a large stone on the sea-shore, which had been surrounded with water, near the monastery of Ros-bennchuir. To this the Abbess often retired, and it was called, "the stone of St. Cocca, because on it she frequently prayed. According to the English Manuscript Life of St. Ciaran of Saighir, this place was called "Carrig Conchy." As an old legend has it, St. Ciaran went one day on that Rock, and it floated over the waters with him, and returned to its own place again, it being Ciaran's wish it should so happen. The Martyrologies of Marianus O'Gorman and of Cathal Maguire state, that the Natalis of this saint had been celebrated, on the 29th of June, in the church of Ros-bennchuir. We do not find her name occurring on this day, in the copy of the Irish Calendar, belonging to the Ordnance Survey Office, Phoenix Park. She is entered, however, in the Martyrology of Donegal, as Cocha, of Ros-Bennchair. St. Bigesg, Bicsecha, or Bigsech, Virgin, of Kilbixy, County of Westmeath. The simple entry, Bigsech, Virgin, appears in the Martyrology of Tallagh, at the 28th of June. This holy woman is called the daughter of Bressal, and she was a saint of the Hy-Fiachra family. She descended from the race of Fiachra, son to Eochaidh Muighmheadhoin. 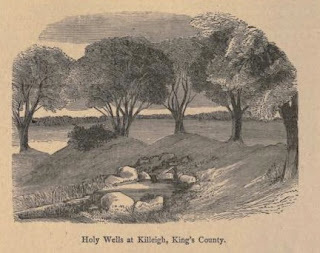 The place—apparently called after this holy virgin—is written Cill Bigsighe, i.e., "the church of St. Bigseach," and it has been Anglicized into Kilbixy, now a parish, in the barony of Moygoish, in the county of Westmeath. This appears to have become an English town of considerable importance, as Sir Henry Piers, who wrote in 1682, relates. Even then it had decayed. Dr. O'Donovan visited this place in 1837, but he found only a few traces of the ancient town. These consisted of—First, the Leper house, a mere ruin; secondly, the site of the castle, but there were no remains whatever of its walls; thirdly, a moat, which had been surrounded by a circular fosse; and fourthly, the site for a gallows. There was a holy well, near the church, then bearing the name of Tobar Bighsighe, i.e., "the well of St. Bigseach." This saint appears to have had another festival, at the 4th of October. The Rev. Mr. Cogan visited this place on the 4th of August, 1863. Then he found one of the old fonts, belonging to a former church, and stuck in the wall of a donkey-stable, at one of the private entrances to the churchyard. He gives an interesting account of this ancient place. At the same date, the name of this saint occurs in the Martyrology of Donegal, with the designation of Bigsech, Virgin, of Cill-Bigsighe, in Meath. AT this date, the Martyrology of Tallagh enters the name Dimman, as having been venerated. The Calendarist O'Clery states he was a Priest. One of St. Patrick's churches, in the territory of Dalriadia, was called Fothrath. This he committed to the care of two disciples, viz. : Cathbad, a priest, and Diman, a monk. Colgan thinks the latter may possibly be identified with the present St. Dimman or Dioman. 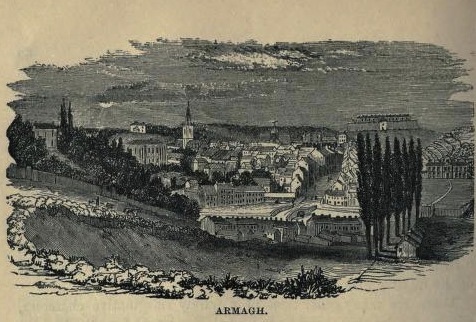 In the Martyrology of Donegal, at June 27th, he is noticed as Dioman, a Priest. St. Soadbair or Soadbar, Bishop. The Martyrologies of Tallagh and of Donegal register a festival at the 26th of June in honour of Soadbair or Soadbar, Bishop. His place is not mentioned. ST. SINCHEALL THE YOUNGER, OF KILLEIGH, KING'S COUNTY. THE present holy man appears to have figured, at an early period, in our ecclesiastical history, although few particulars regarding him have come down to our times. At this date, in the Martyrology of Tallagh, a festival is registered, in honour of Sincheall the Younger. The holy man bearing this name, and known as the Elder St. Seancheall, was the son of Ceanannan, or Ceannfhionnan, and he was venerated, at the 26th of March. Of him we have already treated, at that date; and, so far as we can ascertain from our Genealogies of the Irish Saints, the present St. Sincheall the Younger must have flourished contemporaneously with his namesake, to whom he was related, and not in a very remote degree. A certain district of ancient Ofalia territory was denominated Droma Foda, or "the long ridge;" and this was truly descriptive of an extended elevation over a plain, which is prolonged from the Slieve Bloom Mountains to the Hill of Allen, and from Cruachan co the Hills of Killone near the Great Heath of Maryborough. There was likewise a Cill Achaidh celebrated in our ecclesiastical Annals, and it was situated in Eastern Breifney. The Elder St. Sinchaell seems to have been the first Abbot, and probably the founder of Cill or Gleannachaidh of Droma Foda ; the term Cill having been prefixed, after St. Sincheall the Elder had placed his church there. Wherefore, the denomination Cill Achaidh Droma Fota signifies "the Church of the Field of the long Ridge." Such a rising ground is treacable immediately over the village of Killeagh, and it stretches to the south-west. This place was identical with the present neat group of houses, in the barony of Geashill, King's County. At this village are several traces of old monastic buildings; some of which, however, are almost effaced. But, a considerable part of the more modern portions of an abbey which was there has been incorporated with a fine-looking old mansion and its offices, near that village. In the "Feilire" of St. Aengus, at the 25th of June, the Feast of this St. Sinchell occurs. On this, too, there is a comment, which identifies him with Cell Achid Sinchill, in Offaly. It seems probable enough, that the present holy man spent some time in the monastery of Killeigh with the Elder St. Sincheall, and that he succeeded him in the government of a community there established. This was probably sometime after the middle of the sixth century. It is stated, that soon after the arrival of the English, the family of Warren had established a nunnery here, for nuns of the Augustinian Order. According to the "Annals of the Four Masters," O'Conor Faly erected a monastery at Cill Achaidh in 1393 for Friars of the Order of St. Francis. A part of this modern religious house is said to be still standing, while tradition relates, that it was formerly very extensive, and that the friars who dwelt there were very numerous. It is the opinion of John O'Donovan, that the ruins of both these religious foundations are near the present Protestant church and the cemetery adjoining. Below is a paper published in 1922 on the Life of Saint Rumoldus of Dublin, in which the writer admits that he is a saint not well-known in the land of his birth. 1922 was a rather momentous year for Ireland, and the writer, J.B. Cullen, cannot contain his nationalist enthusiasm from spilling over into the text at various points. Indeed, Cullen presents the lack of martyrs at home as an act of divine providence, for we were a 'chosen people' destined to spread light and learning to other nations, and for that some heroic Irish saints, like Rumold of Dublin, had to embrace martyrdom. The sources record June 24 as the date of Saint Rumold's martyrdom, but due to the clash with the feast of Saint John the Baptist, Pope Alexander IV transferred his feastday to July 1. IN the accounts handed down to us of the first centuries of the Irish Church, and in the several calendars in which the names of our national saints are preserved, it is very remarkable how few martyrs are commemorated. Writers of ecclesiastical history, alluding to this fact, frequently notice that Ireland was the only spot, in the whole of Christendom, where the Gospel took possession without resistance or bloodshed. The introduction of the faith, which in other countries brought Christians to martyrdom, in Ireland led them into monasteries and sanctuaries of peace. This justifies us in thinking that Divine Providence facilitated in a special manner the conversion of this chosen people, whom He destined to carry the light of faith and learning over land and sea, and to regenerate whole nations, whose children were steeped in the darkness of paganism, superstition, and idolatry. The limited number of our early saints who were privileged to clasp the palm of martyrdom, for the same reason, were, it would seem, forced to seek the prize they coveted in lands far beyond the encircling seas of their native isle. St. Rumoldus was one of these. The name of the Saint takes various forms : Rumoldus (Latin), Romoel (Irish), Rombaut (Flemish), etc. St. Rumoldus was born about the close of the seventh century. His father, Datha, was then King of Leinster, his mother being daughter of the King of Cashel. The faith of Christ was well established throughout Ireland at the period of the Saint's birth, an event which was attributed to the miraculous efficacy of prayer. His parents were advanced in years, and had long abandoned the hope that one of their line should succeed to the throne of Leinster. Both were excellent Christians and, through the influence of their position, rendered, in these remote times, great services to religion. Gaulafer, the saintly Bishop who then occupied the See, which then represented that of Dublin at the present day, was the fastest friend of the worthy King and Queen. In his efforts to promote the moral and religious welfare of his people they were always ready to aid him. The saintly prelate, consequently, often thought within himself how great a change might take place, in religious matters, after the death of King Datha. The laws of tanistry regarding the succession might, he foresaw, possibly transfer to less worthy hands the sceptre of his kingdom. The fervent and constant prayer of the zealous Bishop was that this misfortune if God's Will might be averted. His petitions were heard, and great was the surprise and joy throughout the province when the birth of a prince was announced. The infant prince received baptism at the hands of the saintly Bishop who like Holy Simeon of old rejoiced that he had lived to see the auspicious day he had so ardently longed and prayed for. When our future saint came to the years of reason, his parents entrusted his spiritual training and education to Bishop Gaulafer. In addition to the training in the ways of religion and virtue, instructions in the science of war and government were not neglected. The boy, on his part, gave early promise of being a wise and capable ruler. But, as we shall see, the ways of men are very often not the designs of Divine Providence. When his education was completed, Rumoldus passed the remainder of his early life in his royal home. The comeliness of his person and the excellence of his disposition had more than ever endeared him to his parents, no less than to his tribesmen, who looked forward to the day when he should be their king. However, in his inmost heart, Romoel craved not the honours of the world nor the wearing of a royal crown. To the surprise of his countrymen, and despite the tearful remonstrances of his loving parents, the young prince determined to forsake his beloved home and embrace the religious life. We are indebted to foreign sources for most of the particulars that weave around our pen in this brief sketch of our Saint's career. His wonderful sanctity, humility, and austerities are spoken of with lavish admiration by all his biographers. On the death of Gaulafer, Rumoldus, being then a priest, was unanimously chosen as his successor, and so conspicuous were his wisdom and talents that, when his royal father died, the chieftains and people of Leinster determined to accept no other than the Prince-Bishop of Ath-Cliath for their king. However, Rumoldus, who at his ordination had renounced his claims to earthly honours, would not hear of the popular demand. The people, on their side, insisted that he should fill jointly the office of king and bishop. It was an hour of great trial to the Saint, during which, it is related, he was frequently sustained and comforted by miraculous visions, and was often favoured by visits from the ministering angels of God. Casting his cares on God and fervently invoking the Divine guidance, at length a life's decision was made. Rumoldus determined to steal away from his native country, whose people, in their boundless admiration for his holiness and virtue, compelled him to chose exile in order to escape the dignity they would fain force upon him. Disposing of such personal possessions as he had, and without making known his intentions to anyone, he left Ireland for ever. Crossing the dividing seas between Ireland and the Continent, he directed his footsteps along the usual route of pilgrims in those days through Flanders and along the banks of the Rhine till, at last, he reached Rome. His visit to the Eternal City was made for the purpose of laying his future projects before the Vicar of Christ. Moreover, we must remember that he was still Bishop of an Irish diocese, and then, as now, he could not renounce his sacred office without the sanction of the Holy See. Stephen III was, at that time, the reigning Pontiff (752-757), by whom Rumoldus was received with paternal affection and veneration. Divesting himself of the insignia conferred upon him at his consecration, he laid them at the feet of the Pope, whom he besought to release from his episcopal charge. Having fully explained the motives that impelled him to come to this resolve, he humbly petitioned the Pope that he might be granted the apostolic commission to retrace his steps to Central Europe, and there preach the Gospel in some of those countries where in his Romeward journey he found the inhabitants practising the darkest forms of paganism. Realizing that the holy man was evidently inspired to do great things for the sake of Christ, the Holy Father yielded to his entreaties, and, furthermore, gave him permission to choose the place of his future mission, wheresoever he felt himself called upon by Almighty God to labour for the salvation of souls. Rumoldus, giving thanks to Divine Providence, earnestly besought Heaven that the scenes of his future career might be made known to him. In answer to the Saint's prayers it was revealed to him that his mission would lie in that part of Belgic Gaul (now the Netherlands) where the rivers Scheldt and Dyle, in their final course, enter the sea (at present the harbour of Flushing). When he had paid his final visits to the shrines of the Apostles, and the tombs of many martyrs, Rumoldus, with the blessing of the Vicar of Christ, set out on his return journey till he reached the Province of Brabant. Here, as he came in sight of the river Scheldt, he recognized, by Divine intuition, the scene of his future mission and ' the place of his resurrection.' Not far from the banks of the river Dyle (a tributary of the Scheldt) he took up his abode, forming a little wicker cell, and beside it a tiny oratory, on the spot now marked by his cathedral tomb. This was the origin of the city of Mechlin (or Malines), whose site was then but a dreary scene. Away from the river sides stretched a waste of desolate moorlands. The district was then scarcely inhabited, and the melancholy silence of the surroundings was broken only by the shrieking of water-fowls or the nightly howlings of wolves and other beasts of prey. The province of Brabant was, at this time, governed by an excellent ruler, Count Ado, who came of the race of the famous Pepin of Heristal. Although Ado's subjects were almost entirely pagans, the Count himself was a Christian. When, after some time, the advent of Rumoldus became known in Brabant, and the news reached the ears of the ruler of the province, the latter's heart was filled with joy. Losing no time, Ado and his worthy consort hastened to seek the Saint and testify their happiness at his arrival. When Rumoldus unfolded to them the heaven-directed object of his mission, both gave thanks to Almighty God for the blessing vouchsafed their people, and for which they had long ardently prayed. Moreover, the worthy pair promised to do all that lay in their power to aid and promote the work our Saint had at heart. From the day of their meeting till the close of Rumold's life, Ado became his dearest friend. The charity and generosity of the Count and his spouse found favour with Heaven, and, as a proof of this, Almighty God vouchsafed them a great earthly and unexpected joy. Though married for many years their union was not blessed with children ; but shortly after the time of which we write a son was born to them. Beyond the happy parents themselves no one rejoiced more than the grateful Rumoldus, and it was the pious belief of all that the child was the gift of his prayers. The ceremony of holy baptism was performed by our Saint, who conferred on the little boy the name of Libertus. In gratitude for the goodness of God, in their regard, the zeal of Ado and his wife was doubly increased in promoting Christianity throughout Brabant. Not far from the abode of St. Rumoldus was the hermitage of Gundemar, a venerable recluse. There was much communion of spirit between the two holy men. Often when, perhaps, wearied with his toils, our Saint would stray across the dreary waste to meet his friend at a spot marked by a spreading oak tree, beneath which both conversed on heavenly things. It was here, one summer's evening, that the news reached them of a great calamity that had befallen Count Ado. Libertus, the joy and hope of his parents' hearts, was accidentally drowned, and his body borne away by the fatal waters of the Scheldt ! Rumoldus was grief-stricken when he heard the sad tale. He dearly loved Libertus ; and as few more than he rejoiced at the child's birth, none, save his bereaved parents, sorrowed more at his untimely end. Hurrying to the scene of the accident, where crowds of mourners had gathered and were seeking for the body, Rumoldus raised his eyes to heaven and prayed that the sullen waters might yield up the beloved dead. Suddenly, to the joy of all present, the child arose and stood before the multitude, says the old chronicler, ' alive and unharmed'! This miracle received an everlasting remembrance in Belgium, and in the ancient liturgy of the Church it finds commemoration in the Votive Mass of St. Rumold. The report of the miraculous occurrence was soon spread far and wide the calling of the dead to life, as in Galilee of old, through the power of the living God, in answer to the prayer of His servant, and was followed by the wholesale conversion of the peoples among whom Rumoldus laboured. Unspeakable was the gratitude of Ado and his countess. Gifts of gold and silver, as well as grants of land, were placed at the disposal of the Saint, whom they regarded as their intercessor before the throne of God for the restoration of their child from death to life. The Saint, however, declined to accept those earthly gifts as personal favours, but suggested that all might be devoted to the erection of a church and the founding and endowment of a monastery. Needless to say, the holy desire of Rumoldus was unhesitatingly granted. Being always full of veneration for the martyrs of the early Christian Church, our Saint dedicated his new foundation in honour of St. Stephen. Soon numbers of aspirants entered the monastery, and in later years it is not surprising to find on the roll of Rumold's community, the name of the child of prayer Brother Libertus. Rumoldus, who was instrumental to such an extraordinary degree in fulfilling the designs of God, was, alas ! destined to close his marvellous career with the seal of martyrdom. His powerful remonstrances and denunciations of immorality aroused a fierce animosity against him on the part of one of the nobles of the province. Blinded with the desire of revenge, he plotted the death of the holy man. Hiring some accomplices, wicked as himself, they watched their opportunity to waylay the saintly abbot, and, one evening, finding him in a lonely place, as he was returning to his monastery, they seized him, and carrying him into the depths of a neighbouring forest, murdered him! In order to conceal their crime the miscreants then brought the body to the riverside and sunk it with heavy weights at a spot overhung by spreading trees. However, when the darkness of night set in, a mysterious flame of light was seen to hover above the spot, which attracted the notice of some fishermen. Night after night the light appeared at the same part of the river. The report of the occurrence soon spread. In the meantime, the unacccountable disappearance of the abbot from his monastery gave rise to various misgivings as to what might have happened him. One night Count Ado, accompanied probably by some of the monks, having elicited the willing services of a few fishermen, rowed out to the spot over which the light appeared, for the purpose of dredging the river's bed. The sad conjectures they entertained proved, alas ! too true. In the very place, the body of the Saint was drawn up to the surface of the water ! The precious remains, followed by his sorrowing monks and his beloved friend Ado, were at once borne to the church of St. Stephen, where they were eventually laid to rest. In the sacred calendars of the Church his death is registered under date June 24, 775. It is remarkable that the death of St. Rumoldus, who always had so much devotion to the early Christian martyrs, fell on the feast of the 'beheading of St. John the Baptist'. Since the martyrdom of St. Rumoldus the people of the Netherlands have been faithful to his memory. In century after century his jubilees have been celebrated with becoming splendour and devotion, and were observed as national festivals. In his native Ireland his existence is almost forgotten. The cathedral of Mechlin is the noblest, and probably the costliest, monument ever erected to the memory of an Irishman. The present structure, on the original site of St. Rumold's monastery, was begun in the thirteenth century, but was, to a great extent, rebuilt in the fourteenth and sixteenth centuries, and it has been the archiepiscopal metropolitan church since 1560. Above the great altar of the cathedral the relics of the Saint rest in a costly shrine. Despite the outbreaks of revolution which have so frequently desolated Belgium, the remains of the Patron of Mechlin were never desecrated. Whenever the hour of danger was at hand, faithful sentinels were always ready to secure and conceal those treasures of a nation's faith. The various shrines in which the relics were preserved were objects of strange vicissitudes from time to time. In the year 1528 the Reformers, under the Prince of Orange, despoiled the reliquary of its costly jewels. Again, in 1793, another casket, more beautiful than the first, was carried oft to Brussels, by the French, and there melted down. The present casket, an exquisite work of art, was wrought by a celebrated goldsmith of Mechlin, and rests, as we have already said, over the high altar of the church. In the south aisle of the cathedral a series of twenty-five panel paintings adorn the walls. These were executed by famous Flemish artists (fifteenth and sixteenth centuries), and having been removed to Paris by the French, were restored in 1813. The chimes of the cathedral tower rival those of Bruges, as the finest and most perfect in Belgium. It may be noted that St. Rumold's cathedral, among the many works of religious art that adorn it, contains, in the south transept,' The Crucifixion,' by Van Dyck, which is admitted to be the great artist's masterpiece. It is a marvellous composition every detail of the picture bears the closest inspection. 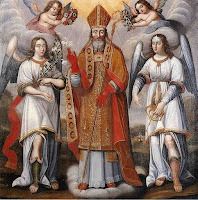 In an earlier part of this essay we remarked that St. Rumoldus is seldom thought of in Ireland, and perhaps we might add that only a limited amount of veneration is accorded him in the land of his birth. But, in touching upon this subject, it is pleasing to note that in one church of the metropolitan city of Ath-Cliath (the ancient territory over which he once ruled as Prince-Bishop), the church of Rathgar, a fine life-size statue of this royal saint and martyr may be seen in one of the niches of the triforium of the sanctuary. It stands at the extreme right, facing the figure of St. Laurence O'Toole. The three intervening recesses are fitly occupied by the figures of the 'Three Patrons of Ireland,' to whom the parish is dedicated. This shows that our Irish Saint had not escaped the thought of the learned and venerable Dean Maher, P.P., through whose zeal the fine classic church of Rathgar as well as that of Rathmines were erected just a century ago (1822). It is regrettable that the names of the saints of Ireland are not remembered by Irish parents when giving names to their children at baptism. Perhaps, this suggestion might be more effectively carried out if children were given names chosen from the Irish calendar of saints on the festal day of Confirmation. This custom, if more generally adopted, would give the youth of Ireland a deeper interest in the lives and virtues of the saints of the land that bore them.
. . . bann'd and barred forbidden fare. Let us hope that in the near future a full and impartial history of Ireland will be compiled by competent scholars and willing pens. Manuscript materials for such a task are available in abundance. In days of political troubles and of religious persecution these national treasures were scattered through the libraries of the Continent Rome, Milan, Vienna, Salamanca, Switzerland, Brussels, Louvain, and other university centres. Not a few may be found nearer home, at Oxford, the British Museum, London, and in Trinity College, the R.I. Academy, and the Franciscan Library, Dublin. Over many of these vellum pages, in far-off times, our ancient scribes spent long years of incessant labour and literary toil. May we hope they may be yet, and soon, unfolded and their contents brought to light. Speramus. 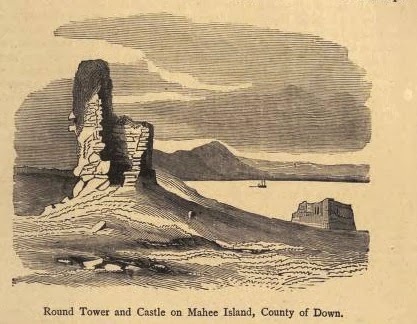 Mahee Island, or Inis-Mochaoi, is so-called from its patron saint, Mochay, who was at first called Caolan. This Mochay is described in the ancient biographies of St. Patrick as a favourite disciple of that great missionary. Aengus's tract"de Matribus Sanctorum Hiberniae" says, "Bronach, daughter of Milcon, with whom Patrick was in captivity, was the mother of Mochay of Aendrum." The circumstance of his conversion is related as follows :—As the saint journeyed from Saul to Bright to convert an important personage, named Bos, who resided in the latter place, he saw a youth herding swine and preached to him. The boy at once obeyed the divine call and was baptised, and having learned all that was necessary with a rapidity which could only be attributed to a supernatural gift, was ordained a priest, or, as the Irish Tripartite Life tells it; "As Patrick was then on his way, he saw a tender youth herding swine, Mochae his name. Patrick preached to him and baptised him, and gave him a copy of the Gospels and a reliquary." The conversion of Mochay or Caolan occured before St. Patrick went to Tara, and we cannot assign to it a later date than 433. Mochay was then a "tender youth," that is, we may suppose, about fourteen or fifteen years of age; he must therefore, have been born about the year 420, and as the Annals of Ulster have recorded his death at the year 496, though the true date is 497 as given in the Annals of Tighernach, it is not unreasonable to assign the year 450 as the foundation of the church of Mahee. That little island soon became not only the seat of piety, but also of education. Colman, the founder of Dromore, and Finian, the founder of Moville, studied under Mochay. The ancient biographer of St. Colman tells the following story regarding his school-days in Mahee :—" After this he was handed over by his parents to the holy Caylan, the Abbot of Nendrum, to learn letters under him ; he diligently taught him and impressed good morals on him. And as he was progressing in age and good morals on a certain day when he had committed his task to memory, he asked the Father Abbot what he ought to do besides. The spiritual father replied—Break into little pieces that rock, over which the brothers stumble when they are going to Matins. This he preformed by making in the first place the sign of the cross upon it. A second time he inquired what more he should do. The Abbot asked him—have you done what was told to you? He, who professed true humility, answered—God indeed has done it. Caylan said—Throw the fragments of the stone into the sea close by. This he did, with angels assisting him. From this circumstance, those fragments reunited together by Divine power are called, Colman's Rock." No doubt, some rock along the coast of the island is the subject of this curious legend, but as the descendants of the ancient Irish have been long since banished from that locality all the ancient traditions have perished. St. Mochay, as a schoolmaster, seems to have followed the advice of King Solomon, "He that spareth the rod hateth his son." So at least it would seem St. Colman, his pupil, thought, as the following incident related of St. Finian in the old life published by Capgrave in the Legenda Angliae, sufficiently indicates. "After this, on the arrival of Colman, the docile boy is given to him to be taught. He instructed him for years in all obedience and humility. It happened once whilst the blessed bishop raised his hand to strike on some account with the rod the holy boy, who was engaged reading, an angel of the Lord caught the hand and held it raised up in the air. At this event, Finian prostrating himself on the ground said—My father why do you not strike me'? and he answered— Child I wish to do that but I am prevented by a Divine influence, if you then desire to be beaten (flagellari) you must go to another master, for from this hour I never will correct you. And he sent him to Caelan, the abbot of Noendrum, and he carefully commended him, that he should have a care for his body and his soul. But he, looking on the countenance of the youth said—This boy never shall be my disciple, for truly in heaven and on earth he far surpasses me in honour and in merit, for he will be a bishop renowned for wisdom and conspicuous for religion and holiness. On hearing this, Finian, moved with a prophetic spirit said—without delay you shall see one come hither, whom I will follow, and under whom I will learn, who will assist me in all my difficulties. And lo! the ships in which was the very holy bishop, by name Nennio, with his people coming out of Britain, entered the harbour in front of the monastery. After these were received with joy and honour, the above mentioned fathers (Colman and Mochay) with all diligence commend the youth to the venerable bishop. He sailed with him, on his return to his own country, and in his place, which is called the Great Monastery, the good monk learned, during some years, the rules and institutions of the monastic life, and he applied himself, with no little success, to the pages of the sacred Scriptures, and through the invocation of the name of Christ, he performed many miracles." See Book of Hymns. The holy bishop who took charge of the young Finian was one of the successors of St. Ninian in the celebrated monastery of Candida Casa or Whiterne in Galloway, and the harbour at Mahee, where he landed and whence they sailed, is probably in the state in which it was fourteen hundred years ago. St. Mochay was both an abbot and a bishop; the old Lives of St. Patrick relate that the national apostle raised him to the episcopal dignity and bestowed on him a crozier, which was in after times called "the flying crozier,"—Eteac Mochai—which was long preserved in Mahee and believed to have been sent from Heaven to him on a certain day, as he was receiving instructions from St. Patrick. The circiunstance is thus related in the Irish Tripartite, "And he gave him also another time a bachall, which had been given them from God—viz., its head into Patrick's bosom, and its end into Mochay's bosom, and this is the Detach-Mochae (the flying crozier of Mochay) of Noendrum." Jocelin relates that, "he profited much the Church of God by his conversation and by his example; and being renowned in virtues and in miracles, was called to Heaven and he was buried in that church wherein he had worthly served the Lord." The Annals of Tighernach record his death at the year 493, though under the year 496, the Annals of the Four Masters enter "Mochay Abbot of Nendrum, died on the twenty-third day of the month of June." His name is thus commemorated in the Martyrology of Aengus on the 23rd of June, the day of his festival. " The renowned and prosperous champion of Noendrum, I celebrate" on which there is the following gloss :—" i.e.— Mochoe of Oendruim in Delvin, or nine hills that are in the place wherein is his church. Or Oendruim, i.e. one hill, is the entire island, and in Loch Cuan (Strangford Lough) it is." Ussher states on the authority of the writer of his Acts that St. Mochay was promoted from the Abbey of Nendrum to the See of Down, and hence Ware makes him the first bishop of that See. The Acts, or Life, to which Ussher refers, are unfortunately no longer accessible, and it is therefore impossible to say whether this was stated by that author as a fact, and not rather as a probable conjecture. However, be this as it may, St. Mochay was succeeded by a long line of successors, who, combining the sabbatical with the episcopal dignity, ruled for many centuries the see of Nendrum, until it finally merged into that of Down. But it would seem that the See of Down at all times exercised some superiority over that of Nendrum, or at least exacted a tribute from it. Jocelin states, "And as Patrick had advanced this man (St. Mochay) from the care of swine, into the episcopate, a swine is yearly taken from that territory, and paid into the Church of Down." The same circumstance is related in the ancient Irish Tripartite " And Mochay promised Patrick a shorn pig every year. And this, indeed, is still given." Rev. James O'Laverty, An Historical Account of the Diocese of Down and Connor, Vol. I, (Dublin, 1878), 353-358. ST. MOCHUA LUACHRA OR CRONAN, ABBOT OF FEARNA, OR FERNS, COUNTY OF WEXFORD. The commentator on the "Leabhar Braec" copy calls him the Comorba, or successor to Moedoc of Ferns. At this date, also, a festival is entered in the Martyrology of Tallagh, in honour of Mochua Luachra idem, ocus Cronan a Ferna. In this passage, St. Mochua and Cronan seem to be distinct persons. However, as already established in a former part of this work, the terms Cronan and Mochua are synonymous, and represent only a single saint. He seems to have been known, likewise, as St. Dachu and Ducua Luachra. There is a Luachair-mor tiara da Inbher, denoting a large rushy land between two streams or estuaries, situated in the barony of Upper Duleek, and county of Meath. There was also a Luachair-Deadhach —now known as Slieve Loughra—near Castleisland, county of Kerry. It seems altogether very probable, that St. Cronan or Mochua had been connected with this district and territory. The present holy man appears to have succeeded St. Moedoc, Bishop of Ferns; and, he is said to have presided over the monastery which was there, in the beginning of the seventh century. The Annals of the Four Masters assign the death of St. Dachu Luachra—as he is called —Abbot of Fearna or Ferns, to A.D. 652, while those of Ulster have A.D. 653. In the Martyrology of Donegal, and at the 22nd of June, is written, Cronan, that is, Mochua of Luachair, Abbot of Fearna. How long the present holy man occupied that position has not been ascertained; but, his name first occurs in the list of Abbots there, after the resignation of St. Moling, whose death has been assigned usually to A.D. 696 or 697. Ferns is the well known See of a Bishop, and situated in the county of Wexford. In this county, also, there is a Tober mac lura, in the barony of Ballaghkeen and parish of Maelnagh. Here, there had been a holy well and a patron. The latter was held on the 22nd of June. Whether or not the present saint attained the episcopal dignity may be questioned; but, the early superiors in Ferns seem to have been styled indiscriminately Archbishops of Leinster, as also Bishops and Abbots of Ferns. St. Suibhne, Bishop of Armagh, County of Armagh. At this date, in the Martyrology of Tallagh, we meet with the following entry, Suibne, Episcopus o Chobran. But there must be some mistake committed by the scribe, when inserting the last word. This holy man is called the son of Cronumail, or Crunmall, son to Ronan of the Ui Niallain, and he was successor to Flan-Febla, who died, April 24th, A.D. 715. The present saint, who is called In-Sui or the Sage, governed the primatial See for a period of fifteen years. The Yellow Book of Lecan assigns, however, only twelve. During his episcopacy, Flahertach, monarch of Ireland, abdicated his sceptre, and embraced a monastic life, at Armagh. St. Suibhney or Suivney died on the 21st of June, A.D. 730. His name is recorded, in the Martyrology of Donegal, at the same date, as Suibhne, Bishop of Ard-Mocha. 20. Faelán, i.e. of Ráith Érenn in Scotland, near Glenn drochta in the west it is. Faelán the Dumb, from Srath Érenn in Scotland. St. Faolan, of Rath Erann, in Scotland, and of Cill Fhaelain, in Leix, Queen's County. At the 9th day of January, we have already treated about a distinguished St. Foilan, Felan, or Fillan, who was an Abbot in Scotland, and a native of Ireland. He is said to have been baptized,by a holy Bishop named Ibar. Now, such a bishop seems to have lived in Leix, at an early period. It is related of that St. Foilan, how it was prophesied, he should be born with a stone in his mouth. Moreover, he was a leper. Wherefore, a suspicion has been suggested rather than approved, that such concurring circumstances might possibly identify him with the St. Faolan of Rath-Erran, in Alba, and of Cill-Fhaelan, in Leix. The latter holy man was venerated on this day. A festival is set down, at the 20th of June, in the Martyrology of Tallagh, and in honour of Faelan amlabair, in StraithEret, in Albain. From a very early period, in the Irish Church, the feast ofthis latter holy man had been kept, as we find it set down in the "Feilire" of St. Aengus, who mentions him with eulogy, as being a "splendid mute." The commentator adds, that he was the son of Oengus, son of Natfraech. He is commemorated, also, by Marianus O'Gorman and by Charles Maguire, at this date. He is designated, moreover, as “Leprosus"—meaning that he was a leper—and it is stated, that he belonged to Laigisia—Leix—a region in Ireland, and that he was of Rath-Eerionn, in Albania. The Bollandists have a notice of this saint, at the present day. In the old Life of St. Attracta, there is a legend related, about how she saved the people of Lugna from the wrath and violence of the King of Connaught, his chiefs, and people, by opening a passage for them through Lough Techet. Only one holy man named Foelan, the servant of a harper, was drowned; and owing to the entreaties of his master, St. Attracta prayed for his release from death. An Angel directed her, to go to the place where he lay; and, obeying this order, she found the body as if laid out in sleep. On touching him, Faelan arose as if from an ecstasy. It seems to be inferred, that this present saint was thus restored to life, after he had been drowned. He must have flourished at a very early period, if the identity be established; but, there seems to be no bond of historic connexion to trace it, either as to time or place, while the whole statement is of an extravagant and legendary character. We are further informed, that Faolan was descended from the race of Aenghus, son to Nadfraech, who is supposed to have been the celebrated King of Munster, bearing that name. If this be so, Faolan most likely was a native of that province, and his birth should be referred to the fifth century. However, there are no safegrounds on which to establish a correct conclusion. It is probable, when he resolved on a place for religious seclusion, a vast wood and a wilderness surrounded that elevated spot he selected for a habitation. There, he probably built a cell, and lived in it for some time. His name, moreover, was ever afterwards associated with the locality, and the spot where his church stood was frequented by devout worshippers, so late as the reign of Queen Elizabeth. 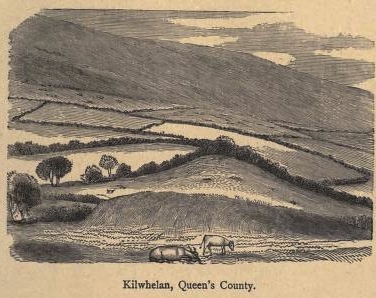 Although Archdall asserts, that the place was unknown, such is not the case; for, Kilwhelan was situated on one of the western slopes of the Cullinagh Mountains, in the Queen's County. The name is still locally preserved. It lay also within the ancient territory of Leix. It is remarkable, that an old disused burial-ground may yet be seen in this townland; while tradition avers, that an old church formerly marked the site, with even greater prominence. The writer has often visited this spot, in early youth, and long before he had acquired a knowledge of its having had a former historic celebrity. At that time, the mound of human remains was a much more prominent object over the surface of an open field, than it now is; cattle have since trampled it down, in its exposed and neglected situation. However, at no time within the present century has there been even a head-stone to mark the site of a grave; but, the peasantry relate, that when the adjoining earth had been turned—even with the plough—human remains, and also pieces of coffins, have been unearthed, which prove, that formerly it was much used as a place for interment. We find the present saint recorded, in the Martyrology of Donegal, at the same date, as Faolan, the Stammerer, of Rath Eronn, in Albain, and of Cill Fhaolain, in Laoighis, of Leinster. June 19th is the commemoration of a 6th/7th century bishop of Nevers, Deodatus (Saint Dié). The evidence that this saint was an Irishman is at best sketchy, but as a disciple of the Irish missionaries Argobast (Arbogast) and Floratius (Florentius), I am pleased to reproduce Canon O'Hanlon's account of his life. 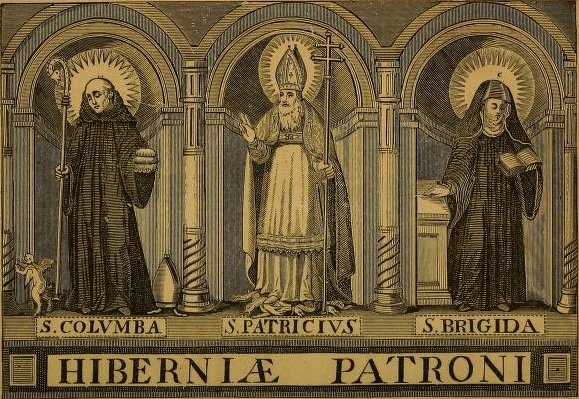 I found the latter two saints most interesting, they seem to have brought a devotion to Saint Brigid of Kildare with them to continental Europe as the church of Saint Thomas, associated with the pair, had an altar dedicated to Ireland's patroness. Whether or not he was a countryman, Deodatus of Nevers was one of their fellow-strugglers in the ascetical life before he too was called to the episcopate. 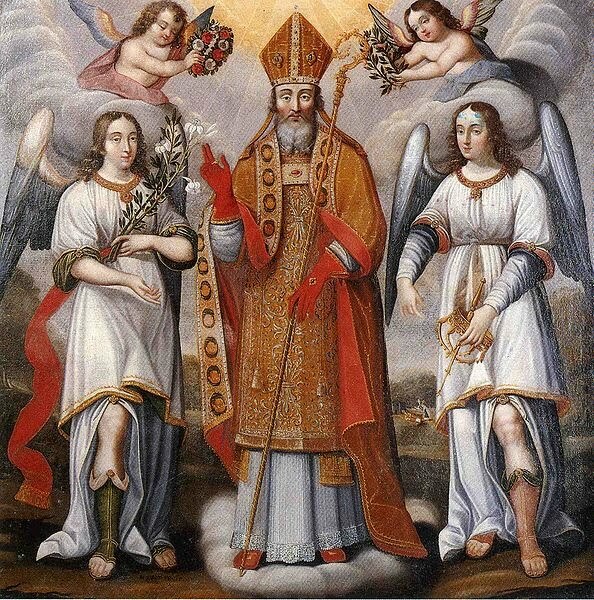 We know not, on what sufficient authority this holy prelate has been classed among the Irish Saints, except it arose from his having been a disciple and companion of St. Argobast and of St. Floratius. At this date, Colgan had intended to publish a Life of St. Deodatus, as we find from the posthumous list of his writings. This is probably the saint, elsewhere called Adeodatus, or Theodatus, bishop of Nevers, and thought to have been an Irishman by birth. This, too, is stated, by Father Stephen White. A Life of the present holy man was composed by a monk of St. Dié, in the ninth or tenth century. This was afterwards amplified by an Abbot of Mayenne, in the eleventh century. This Life was approved of by Pope Leo IX., in the year 1049. Surins has published his Acts, at the 19th of June. These are said to have become vitiated in some passages, through the carelessness of copyists. The Bollandists have published the old Life of St. Deodatus, at the same date; and this is supposed to have been written from collections, made by the holy man's own disciples, by a learned and pious man, who had been inspired to compose the memoir of such a distinguished patron. Different copies of this biography have come down to our times. Before his death, Father Godefrid Henschenn had prepared this Life for publication, and Father Daniel Papebroke afterwards edited it for the press. A previous commentary accompanies it, and several notes are appended. This Life had been previously edited at Nancy, in the year 1619, and it was afterwards translated into French, by Jean Ruyr or Ruer, in 1624, and printed at Trecis. The Petits Bollandistes have a Life of this holy man, whom they designate as St. Dié, Didier, Deodat, Adeodat, or Dieudonne, Bishop of Nevers. There are notices of St. Deodatus by Rev. Alban Butler, and by Rev. S. Baring-Gould. The old Life of St. Deodatus informs us, that he belonged to an illustrious family of Western France. In French, the name has been rendered into Didier, Did or Dieudonne. He was born about the year 590.From early youth, he was distinguished for his virtues. While he made progress in learning, the fear of God was continually before his mind. About his youth and manhood little is found recorded, but that he was dear to the Almighty, and loved by all who knew him. After the death of Eucherius, he was elected bishop of Nevers, about the year 655. He fulfilled all the duties of this pastoral charge, but with great fear and trembling, knowing the responsibility he had assumed. He assisted at the Council of Sens, a.d. 657, under the presidency of Archbishop Emmon, and there he met St. Ouen, Bishop of Rouen, St. Faro, Bishop of Meaux, St. Eligius, Bishop of Noyon, St. Amandus, Bishop of Maestricht, St. Palladius, Bishop of Auxerre, and St. Leucon, Bishop of Troyes. This holy bishop occupied the See of Nevers for three years, when he resolved on a life of solitude. He recommended a successor to his clergy, lest the ship of Christ's Church should be left without a skilful pilot. However, in retiring from the more busy scenes of episcopal life, St. Deodatus found companions in St. Argobast and St. Florentius, who were the first bishops of Strasburgh. The first of these holy companions had his dwelling in the sacred grove, which in the German language is called Heilgestorst, and there he passed an eremitical life, until he was called upon to preside as bishop. In another desert, and near a rivulet known as Hasale, in Alsace, the second holy man had built an oratory, and from this he was removed to succeed St. Argobast, when the See of Strasburgh became vacant. Taking with him three companions, Villigod, Domnole and another Dieudonne, St. Deodatus left Nevers, to seek a place among the Vosges Mountains, and he went to Romont, and afterwards to Argentelle. There he thought to have rested and to have built a monastery. He had even begun to raise its walls, when the people of that district, conceiving a jealousy towards the saint, excited distrust and persecutions. Foremost among his enemies appears to have been the lord of the soil, who would not suffer him to reside on the banks of the Arrentelle. Whereupon, the holy man left that place, and then directed his course through a broken and desert country, until he reached Alsace. At length, he reached the forest of Haguenau, among the Vosges Mountains. There, he lived an eremitical life, with St. Argobast, until the latter was elected bishop of Strasburgh. Even here, Deodatus did not escape contradictions and illwill, manifested by the foresters; so that, for the sake of peace, he was obliged to look elsewhere for a settlement. Afterwards, Deodatus moved to the Island of Novientum, afterwards known as Ebersheim. It is situated on the Ill, about two leagues below Schelestadt, and seven leagues from Strasburgh. In 661, St. Deodatus associated with some solitaries there, and he was elected their superior. His virtues attracted many pious persons to live under his rule. The lord of that territory, Val de Galilee, was Hun, who bestowed it on the saint. It was near the Vosges Mountains. Such was the origin of the monastery of Ebersmunster, in the diocese of Strasburgh. The King of Austrasia, Childeric II., aided him to found the Abbey of SS. Peter and Paul, in that place. This he is said to have placed under the rule of St. Columban, which was subsequently changed to that of St. Benedict. There he left some relics of St. Maurice, chief of the Theban Legion, while the consecration of our holy bishop took place in presence of a great concourse of persons. However, Deodatus found, that the resort of persons to his new habitation did not admit of sufficient leisure to indulge in his favourite exercise of contemplation, and he resolved once more to select some other place for a life of solitude. He retired from the companionship of his monks, and finding a lonely spot in the diocese of Basle, he built a hermitage at Ongiville. Finding, however, that these solitudes were infested by marauders and disturbed by petty warfare, he resolved to leave that part of the country, and return to the Vosges Mountains. He traversed the valley of Kaisersburgh, and for some time, he dwelt in a place, which afterwards took its denomination from him, and it was called Diedolshofen or Diedolshausen, affixing the epithet of "good man" to his name. At length, he settled in a quiet valley, where he built in 669 the Abbey of Jointures. It was so called, because it was at the junction of the Rothbach and Meurthe Rivers. From him, that place was afterwards known as Val S. Didier. King Childeric II. Bestowed on our saint a large property near this valley. Here a most fervent family of religious collected around him; and, as his example, morals, and dispositions were so perfect, they deemed it a great happiness to live under his rule. The vigils of Deodatus were frequent, his prayers were continuous, while religious exercises and singing the Divine praises occupied much of his time. So great was his reputation for the mastery of a spiritual life, that his disciples daily increased; and after a little time, they had attained to such perfection, that they separated into different places through the adjoining forests, where they led contemplative lives. In certain situations through the valley of Galilee, Deodatus constructed cells, in which they dwelt; he found the people willing to assist their labours in building and in agriculture. Then, villages sprung up, which subsequently were converted into parishes. Around the Abbey of Jointures, a town grew in process of time, and from the founder it was called St. Dié. It was afterwards converted into a collegiate church. When St. Hildulph had left his See of Treves and had retired to Moyen-Moutier, a holy friendship with our saint was the result. Whenever St. Deodatus visited St. Hildulph, the latter came out to meet him with all his monks, and then taking him by the hand, he was led into the church, where both prayed together. Afterwards, on entering the monastery, both of them spent the night conversing on heavenly subjects and in singing the Divine praises. The same acts of courtesy and of piety were imitated, whenever St. Hildulph came to Jointures. When he grew very old and feeble, St. Deodatus left his Abbey and retired to a little cell, which was near a chapel he had built and had dedicated to St. Martin. Thence he continued to govern his religious with as much care and devotion, as if he had been living among them. At length, having attained nearly the ninetieth year of his age, a mortal illness fell upon St. Deodatus, and his friend St. Hildulph had a heavenly admonition, that the end was drawing near. He was visited in his cell by St. Hildulph during his last illness. From him, Deodatus received the last Sacraments, and by him were his eyes closed in death. During this illness, he recommended the care of his disciples to St. Hildulph, who charged himself with such a duty, and it gave great consolation to the dying saint. The death of this holy man is said to have taken place on the 19th of June, in 679. In a Manuscript Florarius, the date for his Deposition is set down at the 2nd of January. Afterwards, his monks carried the sacred remains to the Church of the Holy Mother of God. They shed abundance of tears for the the loss they had experienced. St. Hildulph offered up the sacrifice of propitiation, according to the rites of the holy Catholic Church, when the body of the venerable defunct Deodatus was committed to the earth. During the year after his death, St. Hildulph often visited the monastery of Galilee, to offer Mass for the repose of his deceased friend. The monks there resumed their ordinary exercises and celebrations; and recollecting the former practices of both saints, they wished to continue the custom of bringing to St. Hildulph the tunic of St. Deodatus. When owing to his great age, St. Hildulph could no longer leave Moyen-Moutier, the tunic of St. Deodatus was brought to him in like manner. Such was his veneration for that relic, the holy Archbishop went down on his knees to kiss it, and he applied it devoutly to his weak limbs. After his death, the religious of St. Hildulph and of St Dié were accustomed to visit each other alternately in solemn procession, and carrying the tunics of their respective patrons, while their bodies had been consigned to the earth, and even while they had been encased in their proper shrines. Great miracles were wrought afterwards, at the tombs of these holy men. In 787, the monks of St. Dié brought the remains of their holy patron in the same coffin, in which they had been deposed by St. Hildulph, and placed them before the altar of the Holy Cross, in the church dedicated to St. Maurice. Not only through the Vosges Mountains, but throughout France, the veneration for St. Deodatus was extended. At the 19th of June, the festival of St. Deodatus is commemorated in an ancient Manuscript Martyrology of the Monastery of Hilariac, in Lotharingia, and in that of Usuard, enlarged by Greven, as also, in the works of Trithemius, of Saussay, of Wion, of Dorgan, of Menard, and of Bucelin. In his Irish Kalendar, Father Henry Fitzsimon, at this date, calls him Theodatus. In his Scottish Kalendar, Camerarius refers the feast of St. Adeodatus, Bishop of Nevers, to the 23rd of March, and to the 19th of June. Thomas Dempster also records the feast of St. Adeodatus, at the latter date. The abbey of Dié was secularized in 954, and to it a chapter of Canons was attached. In some engravings, St. Did is represented as holding a church on his hand; in others, he is represented as reaching his hand towards thunder clouds; while again, he is shown as healing a woman possessed. These pictures have reference to incidents related about this holy man. In the year 1003, Beatrix, Duchess of Lorraine, caused another Translation to take place, when the remains of St. Deodatus were put in a more convenient place, in the church of St. Maurice. When Pope St. Leo IX. Visited the Val de Galilee, in 1049, he there consecrated some altars near the tomb of St. Dié, and notably those altars of the Transept, which were built after the translation of his relics. In the year 1540, on the 1st of October, the chapter reverently opened the shrine of St. Die, and then removed three joints from one of his hands, together with a tooth from the jaw-bone. One of those joints, with the tooth, they sent to Lambert, bishop of Caserte, who was then in Rome. The other two joints were deposed in the sacristy, and in 1618, these were place in a reliquary of pure silver. In the year 1635, the Swedish army burned the shrine of St. Dié, with a portion of his relics, while the rest was miraculously saved. By a Bull of Pope Pius VI., and dated July 21st, 1777, St. Dié was erected into the seat of a bishop. During the French Revolution, the relics of Deodatus were profaned. This See was suppressed in 1801, but it was re-established in 1817. Later still, on the 19th of June 1851, Mgr. Louis-Marie Caverot transferred the sacred relics of St. Dié to a precious shrine made in a pure Catholic style of art. This is also a monument of that respectable prelate's pious liberality, and of his taste, which is manifested in the design.